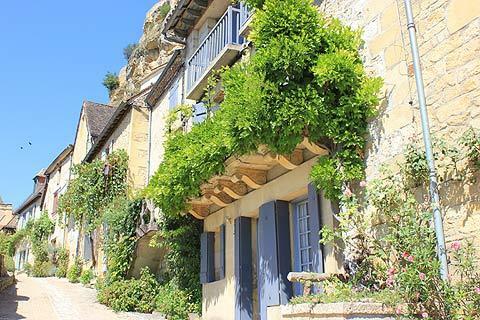 Beynac is a small village on the Dordogne River, eight kilometres south-west of Sarlat in the Dordogne department. 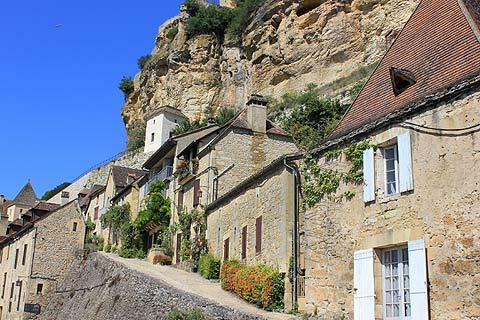 The village is more correctly called 'Beynac-et-Cazenac', Cazenac being its close neighbour, although the full name is not used very often). This very attractive village is spread along the northern bank of the river, and then continues up the hill to the chateau perched above. 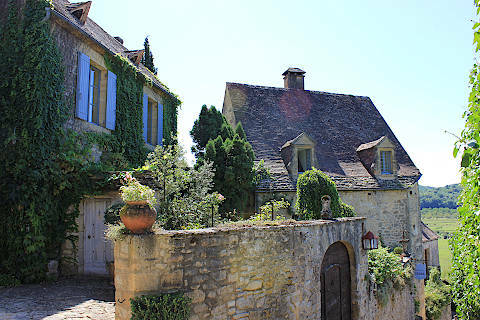 Beynac is listed as one of the 'most beautiful villages in France'. 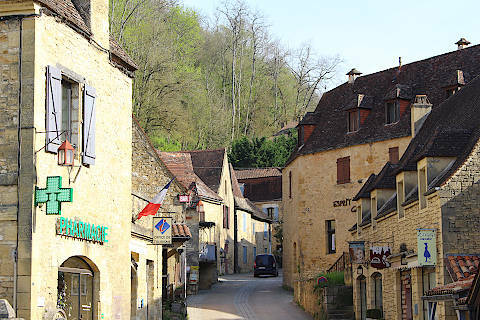 France This Way comment: Beynac is an unmissable destination if you are visiting this part of the Dordogne department, and personally I believe it is one of the most impressive villages in France. 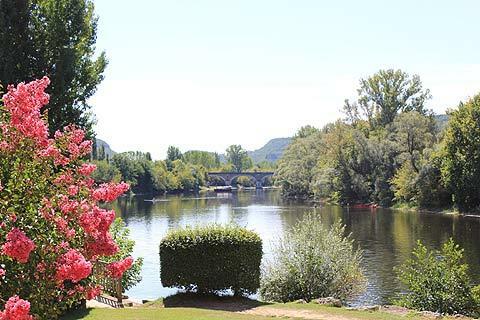 Start your visit with a stroll along the riverside to appreciate the setting. 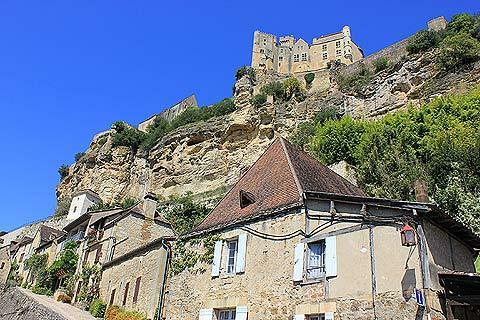 Follow the road a little way to the east of the village for a stunning view of Beynac with the castle perched on the cliff above. Back in the village centre you can follow the main street that climbs the hill - this steep street up the hill is called the basket-makers path (Carnival del Panieraires). 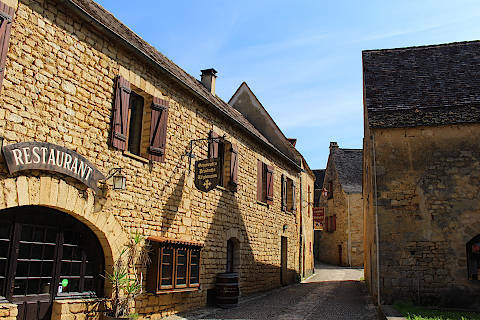 Exploring Beynac is easy as you simply follow this narrow lane as it winds its way up through the lovely traditional Dordogne honey-coloured buildings, taking occasional detours into narrow alleys and side-streets. 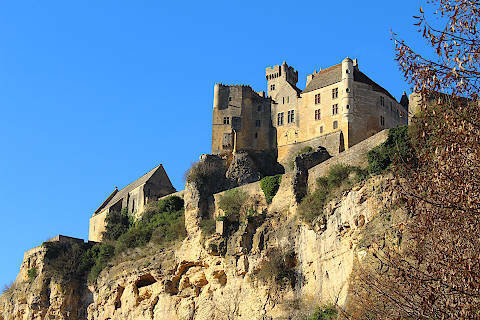 Eventually you reach the highlight in Beynac, the castle set on top of a high cliff looking down on a bend in the Dordogne River and high above much of the little village of Beynac. 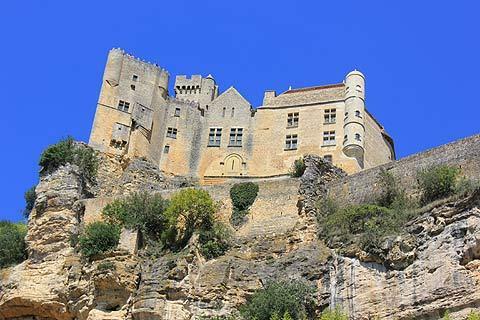 The Château de Beynac was a French stronghold, while the English had to make do with the equally magnificent Chateau de Castelnaud on the other side of the river. 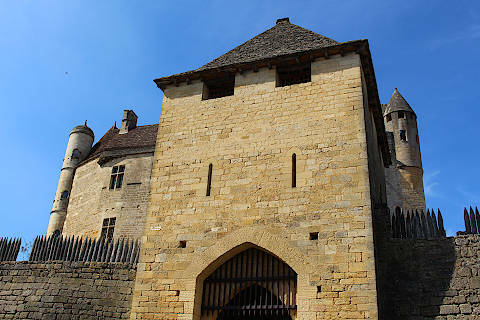 The castle has a suitably colourful history, dating from the Hundred Years War and the Albigensian Crusade, and is a very interesting chateau to visit. 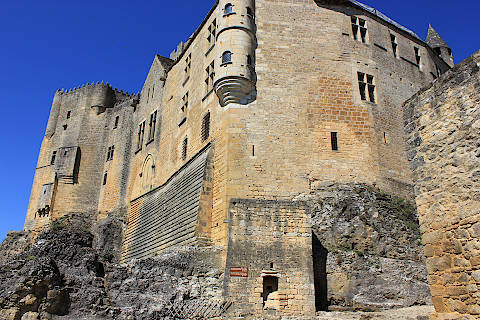 See Chateau de Beynac for more details. The Church of Notre-Dame de l'Assomption was once the chapel for the castle and inside the first circle of fortfications. The church was built in the 12th century with two chapels added in the 16th and 17th century, and still has a stone (lauze) roof. Inside the church, the choir area and the tabernacle are the points of interest. 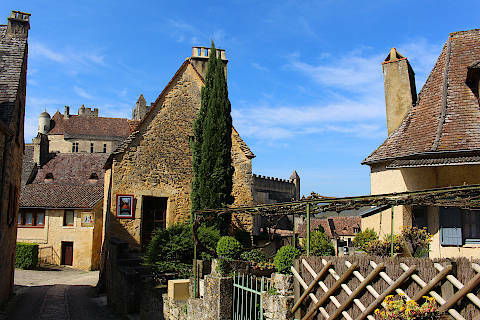 There is also an interesting 'archaeology park' in Beynac, where typical 'neolithic France' buildings have been constructed. 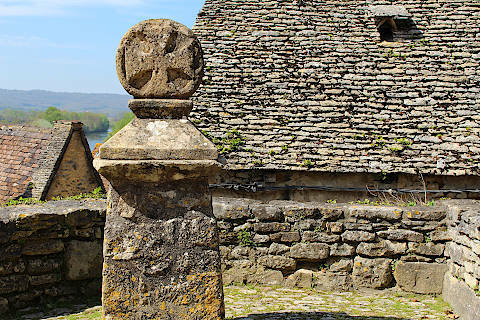 Find time as well to visit neighbouring Cazenac, to see its little church and yet more magnificent views. 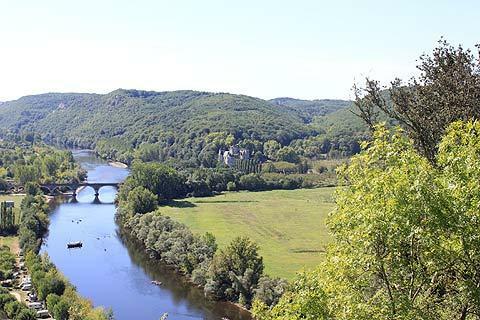 Beynac is a good starting point for many river activities e.g. 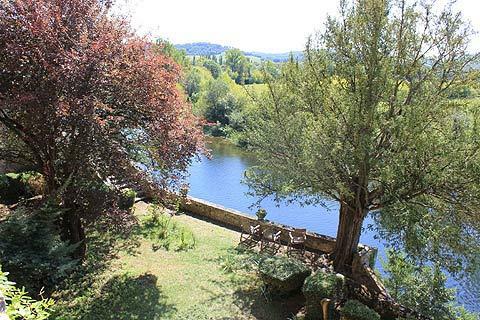 canoeing and fishing, and activities such as walking and cycling in the Dordogne region. Trips along the river in traditional boats called gabarres are also available. 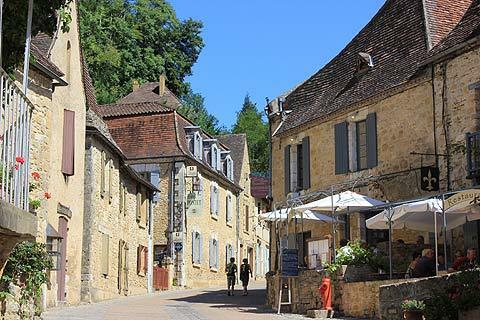 The stretch of the Dordogne River either side of Beynac has a very large number of interesting sights and villages, including for example Sarlat, perhaps the most impressive historic town in France, and the villages of La Roque-Gageac and Domme - both (like Beynac) classified among the 'most beautiful villages in France'. 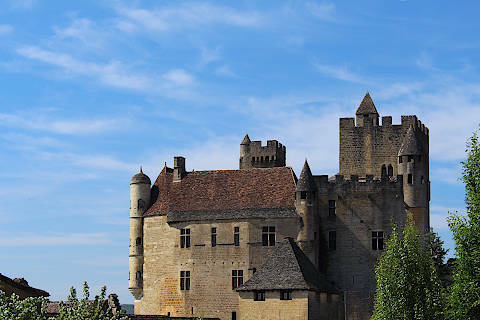 Other Dordogne castles nearby include the Chateau des Milandes to the south-west of Beynac and Chateau de Castelnaud across the river to the south, while the gardens at Marqueyssac are also very popular with visitors.